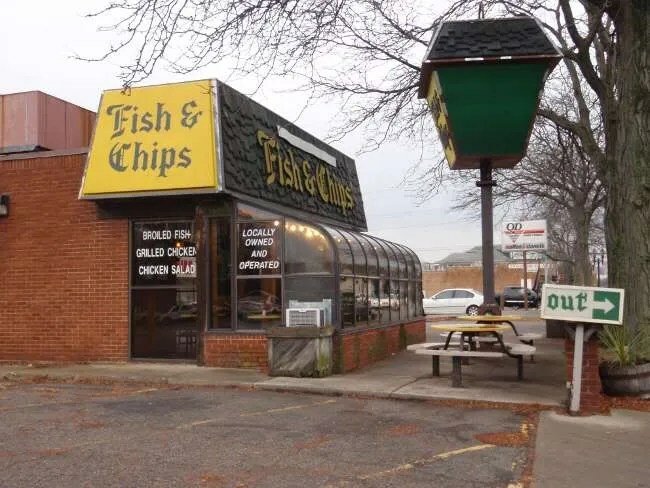 Fish & Chips is on East Michigan Avenue in Lansing right at the corner of Foster Avenue. It looks like the building was a fast food chain in a previous life, but I really couldn’t tell you which one. It’s a pretty cookie cutter building with a sun room that was a popular feature in the 80’s. 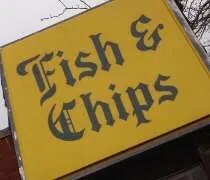 I read somewhere that it may have been an Arthur Treacher’s Fish & Chips from the 70’s. They try to mimmick the interior of a British pub, but it’s just not easy to do unless you go all out. When you try to mix pub and fast food, the look comes off forced. The tables are cheap, plastic, and yellow. There are some booths in the front part of the dining room as well as some wobbly tables in the sunroom extension. The store was empty when I dropped in. There were two guys working. One took my order. The other prepared it. I’m not a fish fan which is pretty nuts when you consider I went to a place called Fish & Chips for lunch, but their window signage said they had grilled chicken. I didn’t see it on the menu, but they did have a Chicken & Chips option. If I would have looked a little more before ordering, they also had a Wing Ding Dinner which also sounded like something I would enjoy. The total was just over seven bucks. The pre-cooked chicken was dumped back in the deep fryer for a final crisping. The chips got the same treatment. It was all loaded into a paper boat with a coupe hush puppies before being delivered to me on a tray with my Pepsi. Since I had time to kill, I just ate at the restaurant. I took a seat in the sunroom and examined my food. I wasn’t sure if I had gotten fish or chicken. The meat in front of me didn’t really look like any part of the chicken I’m familiar with. It sort of looked like breast meat that had been trimmed off the bone, flattened then beer battered and deep fried. In due time, I figured out it was chicken that was meant to look like fish. Even though I’m sort of calling it a mystery meat, the chicken was pretty good. I enjoyed the beer battered treatment and, to my surprise, it didn’t have a fishy taste. The chips were large french fries that could have used a shot of salt when the came out of the fryer. They weren’t bad though and there was salt on the table. I’m not a hush puppy fan, but I gave it a shot anyway. They were alright, but I didn’t take more than a bite. It’s just not my thing. Fish & Chips wasn’t quite what I was expecting, but it did turn out to be a decent, cheap lunch. Since ultimately what I was looking for, I guess they hit it out of the park. 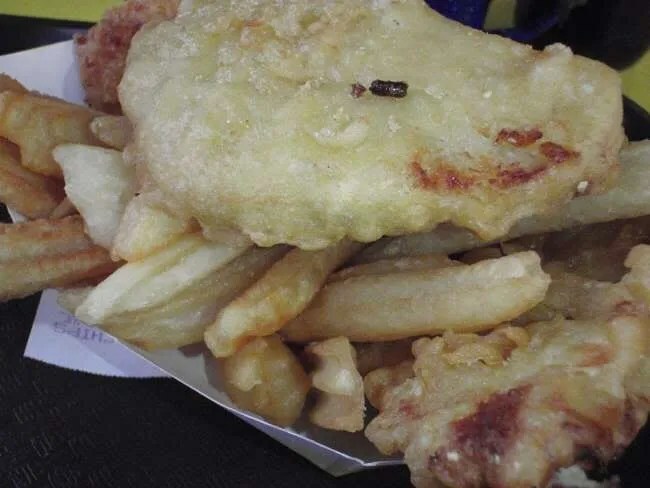 Yes, Fish and Chips is just kind of cheap and greasy – but if you get the perch, in particular, they can make for a decent meal. I suspect their other specials are not bad. (The plain “fish and chips” leaves a lot to be desired.) And for those of us who like hush puppies, they do a good job.